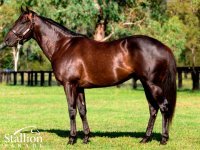 SEBRING Champion 2YO Colt in Australia in 2007-08. 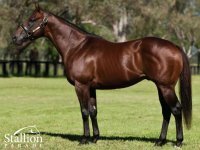 5 wins at 2, A$2,537,060, STC Golden Slipper S., Gr.1, AJC Sires Produce S., Gr.1, Breeders' P., L, Canonbury S., L, STC Darley Guineas Day 2YO H., 2d AJC Champagne S., Gr.1. He entered stud in Aust. in 2009. Third on Aust. Sires List in 2014-15. 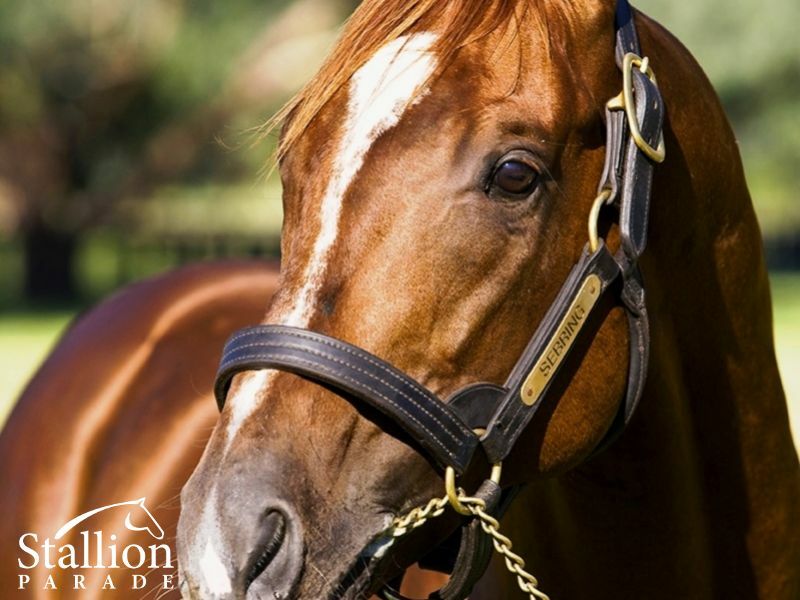 Sire of 704 progeny to race, 469 winners (66.0%), earnings of over $67 million, 51 stakes winners, 48 stakes placegetters, inc.
CRITERION (10c, Bite the Bullet, Afleet). Equal Leading Older Male on the 2015 WTR (Ext. ).7 wins-3 at 2-from 1100m to 2400m, £26,467, A$6,542,200, HK$4,500,000, ATC Queen Elizabeth S., Gr.1, Australian Derby, Gr.1, Rosehill Guineas, Gr.1, MRC Caulfield S., Gr.1, ATC Todman S., Gr.2, Canberra RC Black Opal S., L, ATC Lidoran Group 2YO P., 2d MVRC WS Cox P., Gr.1, ATC George Ryder S., Gr.1, Spring Champion S., Gr.1, VRC Australian Guineas, Gr.1, MRC Caulfield S., Gr.1, ATC Stan Fox S., Gr.2, Hill S., Gr.2, 3d VRC Melbourne Cup, Gr.1, HKJC Audemars Piguet Queen Elizabeth II Cup, Gr.1, Longines Hong Kong Cup, Gr.1, ATC Ranvet S., Gr.1, Canterbury S., Gr.1, Warwick S., Gr.2, Canonbury S., L, 4th Victoria Derby, Gr.1, VRC CS Hayes S., Gr.3. EGG TART (13f, King's Best, In the Purple). 7 wins from 1300m to 2200m to 2017-18, A$1,291,940, SAJC Schweppes Oaks, Gr.1, BRC Queensland Oaks, Gr.1, SCTC PJ O'Shea S., Gr.2, VRC Auckland Racing Club Trophy, ATC TAB Rewards H., TAB H., 2d BRC Doomben Cup, Gr.1, ATC Theo Marks S., Gr.2, 3d ATC George Main S., Gr.1, Hill S., Gr.2, Apollo S., Gr.2, Craven P., Gr.3, Tab.com.au H., 4th ATC Liverpool City Cup, Gr.3. AMPHITRITE (15f, Redoute's Choice, Noble Bijou). 5 wins from 1200m to 1600m in 2018-19, A$567,405, MRC Thousand Guineas, Gr.1, VRC Edward Manifold S., Gr.2, Vanity S., Gr.3, Rose of May H.
SEDANZER (13f, Danzero, Marauding). 8 wins from 1400m to 2200m to 2017-18, A$804,846, BRC Brisbane Cup, Gr.2, Scone Cup, L, ATC Right2drive H., Chandon H., Boxing Day at Randwick H., Mercedes-Benz Newcastle H., 2d Gosford RC Belle of the Turf H., Gr.3, GCTC Magic Millions Trophy, 3d BRC Premier's Cup, Gr.3, 4th NSW Tatt's RC Chelmsford S., Gr.2, SAJC Auraria S., Gr.3. RINGERDINGDING (15c, Red Ransom, Danehill). 4 wins-1 at 2-from 1100m to 1600m to 2018-19, A$366,295, MRC Sandown Guineas, Gr.2, VRC Springtime H., L, ATC Casino Prince at Vinery 2YO H., 2d MVRC WM Waste Management P., 3d MRC Autumn S., Gr.2, MVRC Red Anchor S., Gr.3. SEABURGE (13g, Encosta de Lago, Laranto). 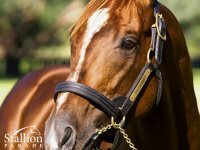 2 wins at 2, A$824,575, VRC Sires' Produce S., Gr.2, 2d VRC Emirates S., Gr.1, MRC Caulfield Guineas, Gr.1, Bendigo JC Golden Mile, L, MRC Cove Hotel 2YO H., 3d VRC March S., L, 4th MRC Caulfield Guineas Prelude, Gr.3, HDF McNeil S., Gr.3. MASTER ASH (15c, Anabaa, Rory's Jester). 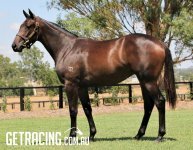 2 wins-1 at 2-at 1250m, 1300m to 2018-19, A$139,060, ATC Up & Coming H., Gr.3, TAB 2YO H., 2d ATC Australian Turf Club 2YO H.
BRING ME SPEED (14g, Keep the Faith, Snippets). 8 wins-1 at 2-to 1500m to 2018-19, Macau Lisboa Challenge, L, Rising Star Cup, L, Lisboa Juvenile, Macau Golden Group Fat Choy Cup. SUPPLY AND DEMAND (12g, Octagonal, Charmande). 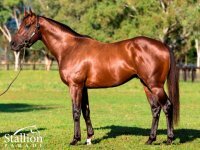 7 wins from 1000m to 2400m, A$661,485, SCTC Caloundra Cup, L, Clarence River JC Grafton Cup, L, ATC Eremein H., Kensei H., Hospital Nurses H., Turf Club H., 2d VRC TCL TV S., Gr.3, ATC Parramatta Cup, L, Albury Gold Cup, L, ATC Robrick Lodge Filante H., Bowness Stud Mile, M Taylor Outreach Program H., TAB More Than Just Winning H., Tab.com.au P., Schweppes H., 3d ATC December H., Tab.com.au H., McGrath Estate Agents H., 4th Scone RC Inglis 3YO Guineas, L.
Third on Aust. Sires List in 2014-15. SEBRING (c by More Than Ready (USA)) 5 wins. See below. 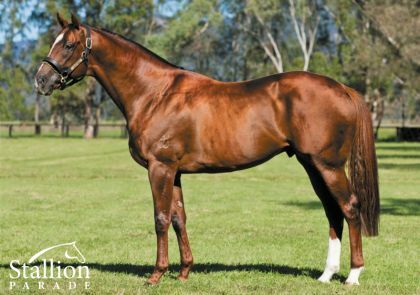 PURENESS (g by Tale of the Cat (USA)) 5 wins to 1500m, A$250,000, ATC Ajax S., Gr.2, AJC Paddington H., Convention Centre H., STC Soft as Soap H., Hyland Race Colours P., 3d ATC Liverpool City Cup, Gr.3, Hawkesbury RC Rowley Mile, L, ATC Greenwood Hotel H.
Falkenberg (f by More Than Ready (USA)) 2 wins at 1400m, 1600m, A$166,250, ATC Schweppes H., 2d ATC November Topaz H., All Too Hard H., Tab.com.au H., 3d BRC Queensland Oaks, Gr.1, 4th Gold Coast Bracelet, L.
Adria (f by More Than Ready (USA)) Winner at 1350m in Aust. 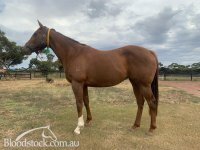 Flingitnow (g by Peintre Celebre (USA)) Winner at 1200m in Aust. Skorost (g by Charge Forward) 4th STC Pago Pago S., Gr.2. La Volt. 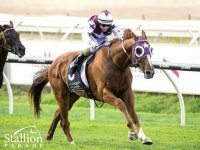 2 wins at 1100m, 1500m, A$76,735, 2d MRC Schweppes H., MVRC New Year's Eve at Legends H., MRC (Mornington) Hoad Construction H.
Red Senna (f More Than Ready) Winner at 1400m in 2018-19 in NZ. 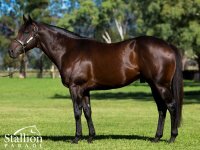 SURTEE (c Memento) 11 wins-5 at 2-to 1400m, A$434,800, AJC San Domenico S., Gr.2, BATC Coca-Cola Classic, Gr.3, VATC Victoria H., Gr.3, Illawarra TC Brambles Classic H., Gr.3, WATC Australia Day S., L, Ngawyni S., L, Perth S., L, Mornington RC RM Ansett S.H., L, Gold Coast Classic H., L, WATC November Flying H., Maniana Quality H., 3d AJC Up & Coming S., Gr.3, WATC Fremantle Dockers Quality H., Selangor Turf Club Trophy H., 4th QTC Sires' Produce S., Gr.1, VRC Ascot Vale S., Gr.2, WATC Qantas Cup, L. Sire. Geology. 7 wins from 1200m to 1900m, STC Prospect H., 2d STC Yarrawarrah H., 3d STC Greystanes H., Taren Point H., St Catherines Fellowship Club H.
Papin. 9 wins from 1100m to 1600m in Aust. Tzarina (f Tobougg) Winner at 2, 2d MRC Merson Cooper S., L.
Denizen (g State Dinner) 12 wins-2 at 2-from 6½f to 9f, 3d Fair Grounds Risen Star S., L.
MORE THAN READY 7 wins-5 at 2-to 7f, US$1,026,229, Saratoga King's Bishop S., Gr.1, Gulfstream Park Hutcheson S., Gr.2, Saratoga Sanford S., Gr.2, Belmont Tremont S., Gr.3, Churchill Downs WHAS-11 S., L, Belmont Flash S., L, 2d Keeneland Blue Grass S., Gr.1, Belmont Vosburgh S., Gr.1, Dwyer S., Gr.2, Fair Grounds Louisiana Derby, Gr.2, 3d Belmont Futurity S., Gr.1, 4th Churchill Downs Kentucky Derby, Gr.1, Aqueduct Cigar Mile H., Gr.1, Monmouth Haskell Invitational H., Gr.1. He entered stud in USA in 2001. He entered stud in Aust. in 2001. Leading USA Sire of 2YOs in 2010. Leading Aust. Sire of 2YOs in 2007-08, 2008-09. Second on Aust. Sire List in 2007-08. Third on Aust. Sire List (AEI) in 2007-08. Sire of 2402 progeny to race, 1764 winners (73.0%), earnings of over $215 million, 191 stakes winners, 156 stakes placegetters, inc.
EAGLE WAY (12g, Lure, Seattle Dancer). 8 wins from 1600m to 2400m to 2018-19, A$517,750, HK$16,737,500, BRC Queensland Derby, Gr.1, HKJC BOCHK Jockey Club Cup, Gr.2, Queen Mother Memorial Cup, Gr.3, January Cup, Gr.3, BRC Sky Racing H., SCTC Coastline BMW H., HKJC Eishin Preston H., 2d BRC Grand Prix S., Gr.3, HKJC Happy Valley Vase H., Jinbao Street H., 3d HKJC Audemars Piguet Queen Elizabeth II Cup, Gr.1, Standard Chartered Champions & Chater Cup, Gr.1, Oriental Watch Sha Tin Trophy, Gr.2, Sa Sa Ladies' Purse, Gr.3, Centenary Vase, Gr.3, 4th HKJC Longines Hong Kong Vase, Gr.1, Standard Chartered Champions & Chater Cup, Gr.1, BRC Rough Habit P., Gr.3, HKJC Queen Mother Memorial Cup, Gr.3, Hong Kong Classic Cup, L.
COPPER BULLET (15c, Unbridled's Song, Peintre Celebre). 3 wins-2 at 2-to 7f to 2018, US$327,345, Saratoga Special S., Gr.2, Churchill Downs Allowance, 2d Churchill Downs Bashford Manor S., Gr.3, Oaklawn Park Razorback H., Gr.3. 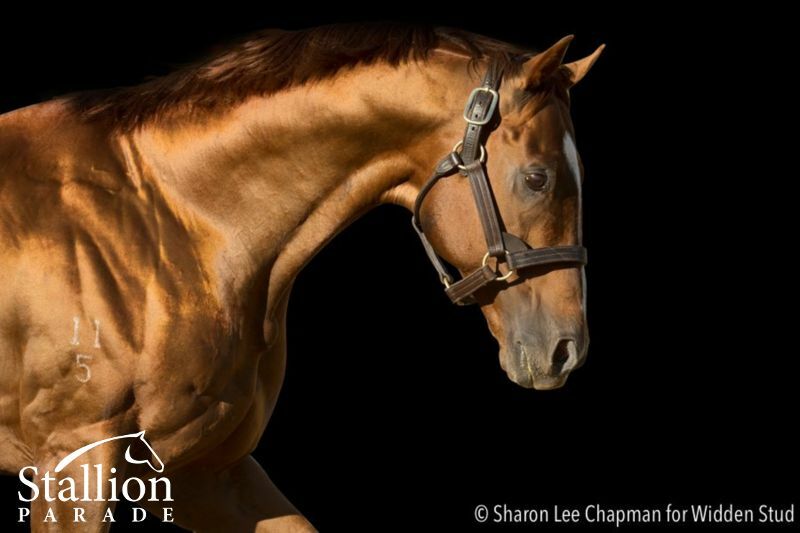 His sire sons include Sebring (51), Gimmethegreenlight (16), Perfectly Ready (7), Ready's Image (7), Custom for Carlos (6), Pluck, Benicio, Verrazano, Better Than Ready, Ready As, etc. 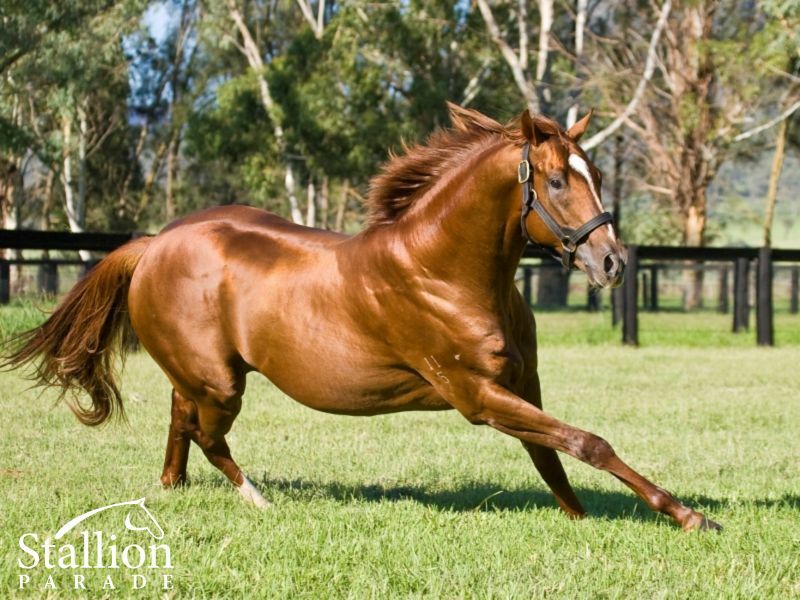 One of Australia’s elite stallions in every aspect. 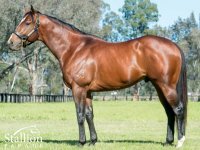 1 of 10 sires to have yearlings sell for $1m+ at the 2017 Easter sale. Two Champion first crop sons standing commercially at stud in the Hunter Valley. 68 black type performers – over 13% Stakes Horses / Runners. 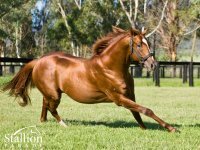 Youngest sire in every Top 10 Sires Table for 2yo, 3yo & General (Prize-Money & Winners). Versatility Personified – Slipper performers, Guineas, Derby & Oaks winners, Magic Millions 2yo performers, a Horse of the Year, International Gr1 winners & even a Melbourne Cup place getter!